Enjoy a fun 9 hour, 2 day weekend tennis coaching break at The Hampshire Court Hotel. This course is tailored to improvers up to strong club players, who are looking to improve their technique and tactical development. The Hampshire Court Hotel has an impressive leisure club and Spa, which offers a great opportunity to relax and unwind from your hard work and efforts on the tennis court. 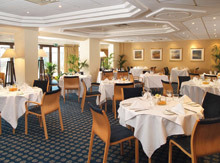 We have selected The Hampshire Court Hotel in Basingstoke as all of the facilities are on site. 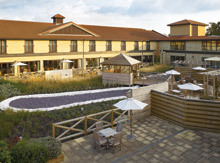 The hotel is very comfortable and has excellent dining facilities, superb leisure & spa facilities and is located just 45 minutes from London, 3 miles from the M3. 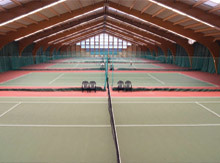 There are 5 indoor acrylic tennis courts. 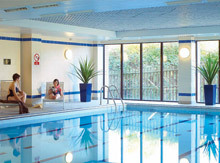 The Hampshire Court Hotel also has an impressive range of leisure facilities which include an adults-only pool, a fun pool for all ages, exercise studios offering a wide range of classes and a fully-equipped state-of-the-art gymnasium. They also have fabulous spa treatment rooms for holistic treatments and massage (please note that these spa treatments and aerobic classes are not included in the cost of our tennis break, and can only be booked directly with the hotel). 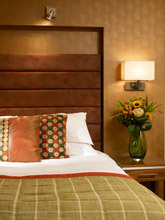 The hotel also offers WiFi access in the public areas and the bedrooms.